A three-level (B1+ to C1) integrated skills course for higher education students at university or on foundation courses. Designed specifically for students at university and on foundation courses, this integrated skills course develops language and real academic skills essential for successful university studies across disciplines. Through authentic lectures and seminars, language informed by Cambridge Academic Corpus and the Academic Word Lists, the course guarantees that students learn English that is up to date and relevant to them. 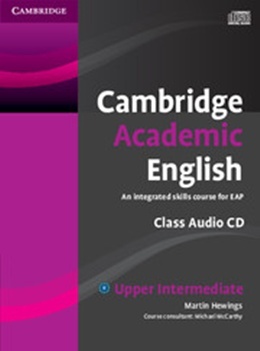 The Audio CD includes extensive listening material with authentic Cambridge University lectures and interviews with university students providing invaluable learning and practice material for developing listening, note-taking, discussion and other skills specific to academic context.